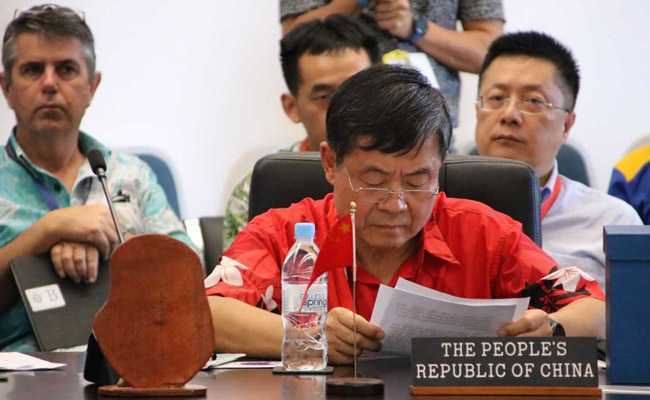 The controversy erupted when the head of China's delegation Du Qiwen attempted to address a meeting but Waqa refused to let him speak until island leaders had finished. Nauru's president has demanded China apologise for a top diplomat's "crazy" behaviour at the Pacific Islands Forum and lashed out at Beijing's "arrogant" presence in the region. "They're not our friends. They just need us for their own purposes," President Baron Waqa told reporters. "Sorry, but I have to be strong on this because no one is to come and dictate things to us," said Waqa, whose country backs self-ruling and democratic Taiwan over arch-rival China in their battle for diplomatic recognition. This year's annual Pacific summit, which wraps up in Nauru on Thursday, has been one of the most contentious in the event's 49-year history. The usual discussions about climate change have been overshadowed by the host's row with China and its treatment of asylum-seekers held on the island under a deal with Australia. The diplomatic spat pits Nauru -- with a population of 11,000 and an area of just 21 square kilometres (eight square miles) -- against the Asian superpower. It erupted on Tuesday when the head of China's delegation Du Qiwen attempted to address a meeting but Waqa refused to let him speak until island leaders had finished. The Chinese delegation then stormed out, with Du reportedly striding around the room to emphasise his displeasure before leaving. "Would he behave like that in front of his own president? I doubt it," Waqa said at a press conference late Wednesday. "He disrespected the Pacific, the forum island leaders and other ministers who have come to join us in our territory. Are you kidding? Look at him, he's a nobody. "He's not even a minister and he's demanding to be recognised and to speak before the prime minister of Tuvalu. Is he crazy?" Waqa had already angered Beijing before the summit began in a row over visas. The exchange with Du highlighted sensitivities over Beijing's rising influence in the Pacific, where China provided an estimated US$1.78 billion in aid to island nations between 2006-16. "We're seeing a lot of big countries coming in and sometimes buying their way through the Pacific, some are extremely aggressive, even to the point that they tread all over us," Waqa said. "From this forum, all leaders (now) know how arrogant some of these people are." He said such behaviour merited an apology from Beijing. "We won't just seek an apology, we'll even take it up to the UN," he said. "Not only that, I will mention it at the UN and every international meeting." China rejected his calls for an apology, instead calling on Nauru to reflect on its actions. "I want to sternly warn Nauru, and whomever is behind this farce: the 'one China' principle is an unstoppable historical trend," said foreign ministry spokeswoman Hua Chunying at a regular press briefing. "It should stop this unreasonable fuss and stop humiliating itself." China does not belong to the PIF but is one of 18 countries that attends the leaders' summit as a "dialogue partner" for discussions with member nations. Taiwan paid for much of the infrastructure used at the Nauru PIF and there could be similar tensions at next year's event in Tuvalu, which also recognises Taipei. Meanwhile Australia and New Zealand have boosted their foreign aid programmes in the Pacific to counter Chinese influence in a region they regard as their backyard.